Notes on Tea will be based in the DC Metro Area this year, specifically Arlington, VA. I have a tea bucket list generated from word of mouth, what I've seen on my walkabouts, and internet searches. Ching Ching Cha was recommended to me by Theresa Wong of T Shop. Several customers and friends told her about this Georgetown tea house. Ching Ching Cha offers...tea lunch, afternoon tea (not British style), and a tasting luncheon! ching ching CHA is a Chinese teahouse in Georgetown, Washington DC established in 1998. CHA is the Chinese word for tea, and Ching Ching is the founder of the tea house. A lofty tearoom that feels a world away. A tranquil, lovely space made serene with beautiful rosewood tables and chairs, platform seating with fluffy cushions, and walls that disappear into overhead skylights. ching ching CHA is a calming, soothing and authentic setting making this an ideal place to enjoy the classic tea ritual. Lady Camellia is also based on Georgetown. The tea room serves afternoon tea. Afternoon tea has always been something that Debby and Han have enjoyed, but they struggled to find a welcoming and accessible tea room in the D.C. area to take part in this leisure. After 2 years of having successfully managed Macaron Bee, The power couple felt ready to expand their brand and share their dream. Around the world, each community holds its unique way of enjoying tea, and here at Lady Camellia we aspire to be the locale that serves as a middle ground where cultures and traditions can intertwine. That’s what Lady Camellia is all about; a pastry and tea room where family and friends can gather to relax, reconnect, and take a break from their busy lives; a place where everyone can come together to enjoy savories and pastries, as well as complement their treats with the finest teas and tisanes. A place to celebrate life. DC hotel afternoon teas are on my list, too. Willard Intercontinental, The Jefferson Hotel, The Empress Lounge at the Mandarin Oriental Hotel, among others. I will check out a couple of chain tea stores. One is Capital Teas, at Barracks Row Tea Bar & Boutique or in the Mosaic District. The other is Peet's Coffee & Tea. Peet's was founded in Berkeley, and I've got a soft spot for that city. I've also been to the original location. There is store in the Clarendon neighborhood of Arlington. The Minor Adjustment Beauty Salon by Alexander McCall Smith. Jamaica Red Rooibos tea. Coconut pecan cookie. #teaandbooks or is it #booksandtea ? Two other Arlington tea places on my list are House of Steep and Northside Social. I learned of House of Steep from Instagrammer steepthoughts. House of Steep also offers foot soaks. Is that weird? Northside Social was recommended to Rotea. One day, we refreshed ourselves there midway of a long, steamy walkabout. Northside Social offers Rishi Tea teas and the list is really impressive. Also, they bake daily muffins, scones, brownies, cookies, pies, and tarts. On another, a had a coconut pecan cookie and a hot Jamaica red rooibos tea. Please leave your recommendations in the comments! 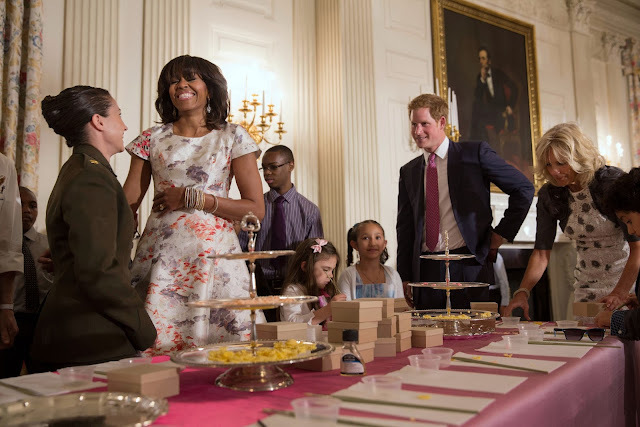 Image source information: First Lady of the United States of America, Michelle Obama, Prince Harry of Wales, and Jill Biden help military children create Mother's Day cards and other crafts in the State Dining Room of the White House on 9 May 2013. The children presented the gifts to their mothers during the Joining Forces Military Mother's Day Tea in the East Room. Photo by Lawrence Jackson. Accessed at Wikimedia Commons.